His thin blond hair cut round in bangs, Soulima Stravinsky stands at medium height, with the identical mustache, hands, and deep bass voice as his father Igor. When he sat, his tense clasped hands at once resemble that famous ink portrait done by Picasso! A round of discussion began. I referred to an early work of Igor Stravinsky’s, the cantata Zvezdoliki, or King of the Stars. Based on a mystic poem with a vague harvest theme by Balmont, it is an enigmatic work for several reasons. The harmonic idiom use is unique to Stravinsky, an elaboration of earlier ideas, and a vein left unexplored after its completion. Set for male choir and orchestra, this colorful work falls between Petrushka and Le Sacre. Quite a company to be surrounded with! Soulima commented that he had only heard the work once, and this was awhile back. It fell into the category of Stravinsky’s Japanese songs. 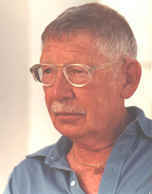 Stravinsky: Zvezdoliki conducted by Hans Rosbaud with the South West German Radio Orch. 1957. 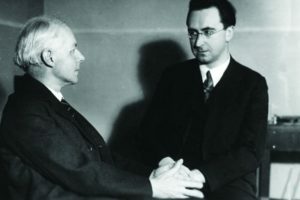 Béla Bartók with Hans Rosbaud. 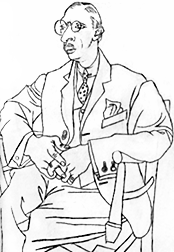 He alluded to Diaghilev, and his prophetic quality in recognizing potential in the young Stravinsky, who approached him with his Scherzo fantastique, an idiosyncratic Russian-styled orchestral work. Diaghilev instinctively felt there were greater ideas to be developed than what he was presented with, and thus Stravinsky was commissioned, resulting in The Firebird. Soulima commented on the nature of opinions, and demonstrated how change may occur. Igor Stravinsky had a loathing of Beethoven’s work in his youth. After studying this music that he despised, and gaining experience, he came to love Beethoven, and considered the Grosse Fuga to be one of the finest compositions ever written. Soulima then was invited to discuss the new work he had composed. For the piano he had just completed Three Fairytales: Cinderella, Jack and the Beanstalk, and Sleeping Beauty. Explaining that he had temporarily ceased concertizing, and had not touched the keyboard in six weeks, he sat at the Steinway grand, and narrated the episodes of each tale as he played. As interesting as the music were the motions of his wide chubby hands, his wrists uniquely pivoting the heavy fingers. Visually, his hands appeared to have the same contact with the keys that jazz pianists convey. What seems to be an instinctive untrained touch, with positions accommodating such large fingers, convey the percussive approach to the keyboard expounded by Stravinsky, Prokofiev, and others. Yet, watching the notions of his hands, the sensitivity and finesse are very elegant. Bach Prelude & Fugue in F#, WTC Book I. Soulima Stravinsky, piano. Paris, 1939.
remarking that it was his first record, made before the Second World War [1 May 1939] for a shop in Paris, Boite à Musique. He was engaged to record a series of works for them. The first was issued but the others never started. He does not possess this disc, and was given a tape of it by the New York Public Library a few years ago. He confessed that, although he was young when the recording was made, he was surprised at how good the playing is. I asked him if and when he will resume concertising. Pointing to the space between his left thumb and index finger, he mentioned that an occasional arthritic pain occurred. When his left hand would play arpeggios, especially the passages in Chopin’s Revolutionary Etude (Op. 10, No. 12), his hand would respond well, but in execution of an ordinary scale, he has felt pain. “I can perform well enough for myself, but for a recital, this would be a little uncomfortable.” Which concerti were in his repertoire? The two of his father’s, eight of Mozart, one each of Beethoven and Brahms, altogether about twenty. He began concertising at age twenty. It did not concern him if he played inaccurately in spots, or had a poor instrument, but Soulima was anxious to give recitals. He had no instruction from his father. The first few piano teachers were of little use. Isidor Phillip, the great French pedagogue, helped him further his artistry. He learned much in technique and style from the great French musician. Of the pianists he’s heard, he admires Horowitz greatly. Having attended the recent orchestral appearance given by Horowitz (“rehearsals. I couldn’t afford $100 for a seat,”) he finds the power in Horowitz’s playing to be magnificent. “You may not care for his approach or for the piece (Rachmaninoff’s Third Piano Concerto), which I don’t particularly like, but the man has great power, and at his age! Did he know Manuel de Falla? He had met him on several occasions and “studied the excellent Harpsichord Concerto. First I practiced on a harpsichord, then switched to piano – the score sanctions this –to do it justice.” Soulima likes Falla’s works. Emphasizing a melody that recurs in his Jack and the Beanstalk, (someone pointed this out to him) he emphasized the importance of letting the music carry out its intentions, and not for the composer to worry about deliberate linking and forming. 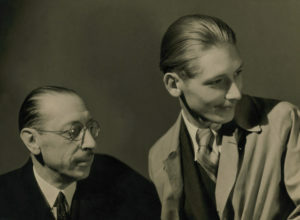 Igor and Soulima Stravinsky play Mozart: Fugue in c, K.426. Do you know whether Arlene Verbeski (Crawford) was a piano student or music student of Soulima at U of Illinois Urbana in the 1960s? Does anyone know of the whereabouts of Daniel Elller, one of Soilima’s prize students when we were there together.? I always expected to see him at Carnegie but I must have missed him.